It seems that it has been quite a while since I have written about the logistics of daily life, so let’s have a look at the logistics of what must count as the most daily of our needs: water. 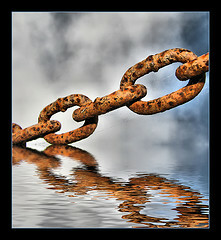 First a truism: water is heavy. Just try to haul around 90 litres of the stuff and you will totally agree with me. In fact, it is so heavy that carrying it can lead to severe health problems. 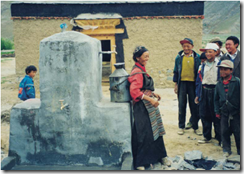 E.g., a 2003 Lancet article describes how 30-40 percent of a rural Tibetan population suffered from chronic back pain (a severe condition in a predominantly non-mechanised agrarian society), before an intervention aimed at correct carrying techniques and the building of ‘back-happy tap-stands’ (no, I really didn’t make that up – see the picture to the right to get an idea what it looks like). In the developed world, we use this really nifty invention for our water logistics: pipes, a technology that has served us well for more than 2000 years (although one shouldn’t underestimate the amount of lead poisoning it has caused over the years – there are theories that it even contributed to the downfall of the Roman empire, although they are unlikely to be correct). For the moment, though, it is unlikely that water infrastructure will come any time soon to the remote areas of least-developed countries: the average Tibetan or Ethiopian subsistence farmer will still need to haul their water from a backbreaking distance. 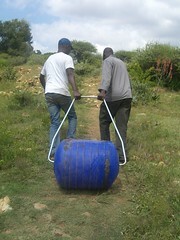 That is why the hippo roller is such a great idea: by transforming the container itself into a wide wheel-like contraption, 90 litres of water at a time can be dragged around with a lot less effort: those 90 kilograms of water suddenly seem to weigh a lot less, and of course it can be transported much more hygienically than in an open container. So is it all downhill work from here? Of course not. Even the hippo roller has some drawbacks that need to be worked on. Probably the most important one is… well, you guessed it, it is logistics. To make this a winning proposition, hippo rollers really should be produced close to where they are used, instead of shipped halfway across the globe: one of the litmus tests for the appropriateness of technology is whether it is feasible to produce it locally. A second issue is penetration: up to now, around 30,000 of them have been distributed, which is (if you allow me a very lame pun) nothing but a drop of water in the ocean. Such small numbers mean that it we really don’t have enough experience yet to know whether it really is such a good idea as it seems to be. 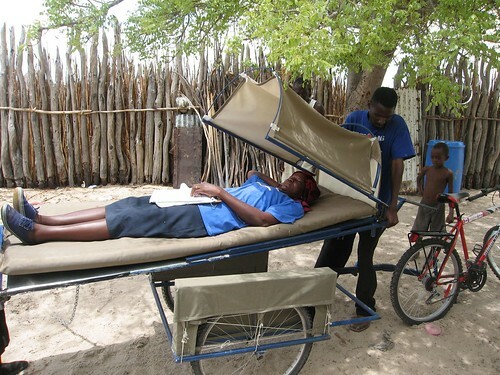 It also means that there is no hippo-roller-repair man in every village, which means that it is unclear what happens with damaged rollers; and as I haven’t been able to find any evaluations yet, I really don’t know how long the average roller holds up in real life, or how easy it is to repair when it does get damaged. Still, it is a good example of how creative thinking about logistics can help us to come up with ideas that will help the majority world immensely – and of how important logistics is for the daily life of all of us. Talking about health logistics, we tend to concentrate on heath systems logistics, i.e. the logistics of the health system. What we ignore is the logistics of daily life and its impact on health. To give one example: obesity is linked to the way our communities are designed and how long we spend in our cars each day. More dramatic examples include how distance from a source of clean drinking water impact on water use, or how transport and in-house storage of that same drinking water can make all the difference between clean or contaminated water. An even more direct link between smallest-scale logistics and health are the risks that many women and girls in developing countries (especially in refugee settings) run when collecting firewood. Here it is not even the logistics that impact on the product (firewood) and hence on health, but the logistic activity (collection) itself that endangers people’s life and health (although there is also an indirect link: the use of firewood as fuel causes air pollution). UNHCR and the Women’s Refugee Commission recently started the Get Beyond Firewood initiative, which is trying to find safe alternatives for firewood. This is a good example of how improvement of the smallest-scale logistics can improve life and health of people in developing countries.